The opening of the Greenpoint Library has been delayed until summer 2019–several months later than the original December 2018 completion date–due to a string of issues involving the discovery of subsurface asbestos. The library has been under construction since October 2017, but the surprising discovery of asbestos within old foundation remnants, coupled with weather conditions and poor soil composition, all contributed to the new target date, according to the Brooklyn Library. The asbestos and foundation remnants were first discovered at the 107 Norman Ave. location in December 2017, roughly two months after the project’s groundbreaking. Workers had stumbled on an old foundation belonging not to the former Greenpoint library building, but to its predecessor—the Carnegie Library. The Carnegie Library, one of many throughout Brooklyn, was built in 1906 but torn down in the 70s to make way for the former Greenpoint Library, which also faced the wrecking ball. The old foundation had asbestos in its steam lines and utility piping, which has all since been removed, according to the Brooklyn Library. But the asbestos removal and subsequent reworking of the upcoming Greenpoint Library’s foundation pushed the building’s opening date back a few month to the spring of 2019. Weather, however, and its affect on the ground soil, contributed to further delays, pushing the library’s completion date to its new summer 2019 target. According to Brooklyn Public Library, the soil composition in this particular location holds onto moisture much longer than common well-draining soil. With a heavier than normal rainfall this past summer, and the inability to begin building on wet soil, the construction was stalled. Construction, however, has since picked back up. The new library, designed by architectural firm Marble Fairbanks, will be double the size of the previous building. Partially funded by a $5 million grant from the Greenpoint Community Environment Fund, it will also be an environmental education hub. 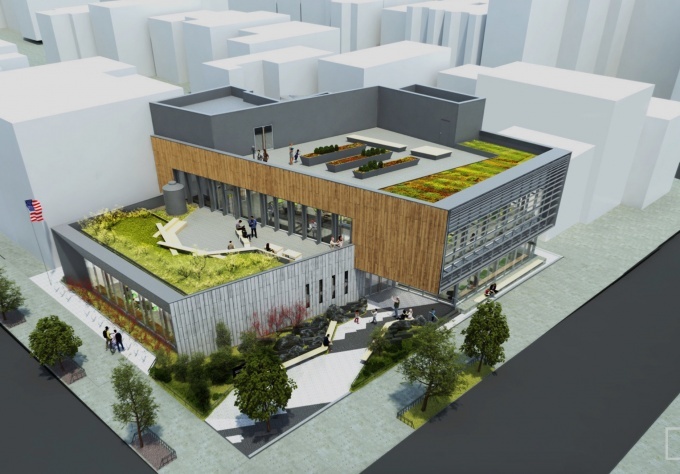 The building itself will feature solar panels, rainwater cisterns, rooftop rain gardens and open green space, reducing energy consumption by 80 percent and saving 50,000 gallons of water each year. The library will also offer 300 environmental programming each year. Until the new library is opened, Greenpoint residents will have access to a Bookmobile service on Tuesdays and Thursdays from 11am to 4pm at the corner of Manhattan Avenue and Norman Avenue. A pop-up library is also available at the Park Church Co-Op at 129 Russell St., and story-time is being held at the YMCA. The library construction’s delay was first reported by BKLYNER. The site has been idle for some time. That’s not a matter of asbestos. It’s incredible how they can find a public building with asbestos issues when developers can knock down any old building and put up a high rise building within a year.